Terry - the all time big fan to Thomas & Friends is still very loyal and hearted with it. I think at the moment, nothing can replace his love to Thomas trains although I kept introducing him other cartoon's characters like Lighting McQueen car, Bob the Builder, Barney, Winnie the Pooh and etc. Not to say, the collection are expanding too. Sticker set, bought at morning market. RM1 each. The stickers still well keep in the plastic and he is not taking it out to stick anywhere yet. Just look see and put back to his bookshelf. Kikansha Thomas Choco Pretzel RM3.50 from Isetan supermarket. Found this during one of our shopping trip when he make fuss. Once he got this, he totally keep quiet and happy munching it. Thomas underwear RM18, bought from a seller in Multiply. Actually there are cheaper one at night market. I only know that after I bought this first pack. 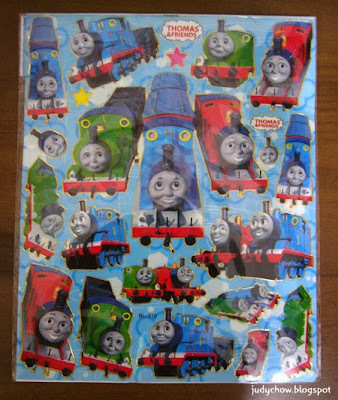 Thomas Tank Engine Quilt Fabric 4 fat quarters (1 meter). Got this from an eBay seller in Australia. I bought 3 fq and she is so kind gave me another fq free make up to 1 meter. Include delivery, it is AU$20.70. (AU$5.45 per fq). The fabric is very good and soft. I plan to make him pillow case and bolster case for him or may be a quilt blanket. Am I spoiling Terry with so many Thomas stuff? Nice Thomas stuff. Like the underwear.